Bollywood actor Akshay Kumar who turned 51 today received birthday greetings from Home Minister Rajnath Singh. "You have great amount of love, respect and compassion for those who fight for the honour of the country," tweeted the minister. Akshay Kumar is a big part of a trust created by the home ministry called Bharat Ke Veer in support of families of CAPF (Central Armed Police Forces) personnel, who have died in the line of duty. Dear @akshaykumar my warm birthday wishes to you. You have great amount of love, respect and compassion for those who fight for the honour of the country. And you also give performances that are ‘Gold’. May Almighty bless you with more success, good health and long life. The actor and producer, who ventured into films in the mid-80s, features in the non-neta list of I-PAC, who is likely to be well accepted by people if he joins politics. The Indian Political Action Committee in June, had launched an online programme, the National Agenda Forum, with the aim to mobilise one crore citizens, to set an agenda for people to choose their leaders in the 2019 elections, as per a report in news agency IANS. Akshay Kumar leads the B-town in acting in films promoting high profile social causes like the government's flagship toilet and swachhta schemes. He won accolades for his films like "Toilet: Ek Prem Katha" and "Pad Man", which earned over $40 million between June, 2017 and 2018. Writer Twinkle Khanna, the actor's wife, also shared a beautiful picture of family birthday celebrations on social media. 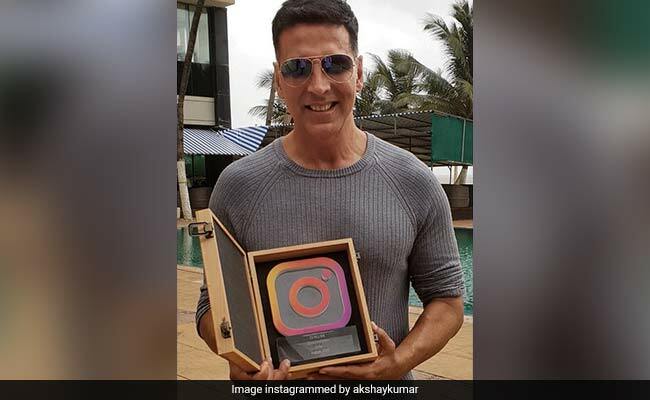 Akshay Kumar is the first male Bollywood actor to have 20 million followers on Instagram. The "Sabse Bada Khiladi" actor was given a memento by Instagram. "Here's another gold from the good people at Instagram. Glad to share, the first Bollywood Actor (Male) to cross the 20 million followers milestone is yours truly. Thank you all once again for the love, sending lots of love and prayers your way," the 'Gold' actor shared on social media.